I learnt my lesson from last weekend and had much better prep for this race. I had a good dinner at a reasonable time the night before. I packed up all my stuff for the race the night before and put my bike and bag in the car the night before. It cuts out a lot of the stress in the morning. Just eat breakfast, fill my water bottles and go. Had a quick breakfast and then hit the road out to Harris Lake. It was about a 30 minute drive, and got there in plenty of time to get my transition area set up. As you can see my transition area is pretty minimal. The sprints are nice because I don’t worry about bike gloves that I use on a longer ride. I have one bottle filled with water and one with EFS so that is all I use in terms of nutrition. I knew the EFS would be a must for this race since it was going to be hot and humid. I wanted to make sure I was getting the electrolytes in during the ride. The swim was 750 meters in the lake pictured above. They announced that the water temp was 90 degrees, so I was very worried about how the swim would turn out. When I checked the water temp for Jordan Lake after my open water swim the other night it said it was 88 degrees. So I took a quick dip and swam around a little bit as a warm up. 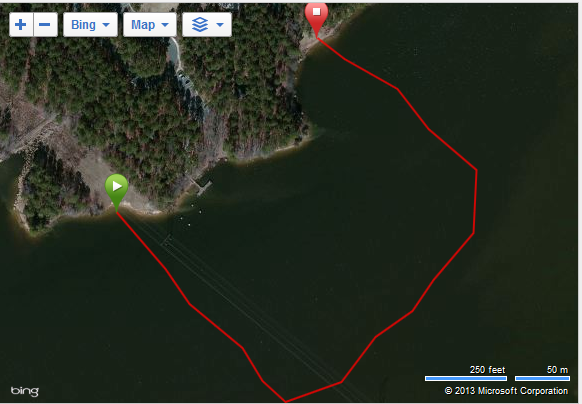 If this was 90 degrees then it was much higher than 88 in my previous swim, because it was nowhere near as hot. It was still pretty warm. My plan for the swim was to take it pretty easy. My last sprint I wasn’t too pleased with my time, but that was my very first one. My main goal was to be a couple minutes faster. I started out on the right side of the back, far side from the buoys. It seemed I ended up between the fast pack and the slow pack which was great. I was swimming on my own for a good while with no one hitting me. Looking at the map I swam fairly straight as well which is always a bonus. I was just over 3:00 minutes in T1 which is disappointing because I thought was quicker than that. That is something I need to work on. Also, they had just cut the grass we were running over, so by the time I got to my bike to put my socks and bike shoes on my feet were covered in grass. I probably lost a few seconds wiping them off. The bike was tough. Once again I was just struggling with the hills. I think the bike is the area where I have the most work to do. I mean, obviously my swimming needs works as well, but I feel like I’ve seen a lot of improvement over year in that. Not on the bike as much. A lot of the roads on this course were the same as on the 70.3 course but in reverse. Which meant I had to climb a lot of hills I remember flying down then. There was one guy for the majority of the course kept over taking me on the steep hills but then wasn’t as fast on the down hills or flat sections, so I spent a lot of time with him until the last two miles or so which was mostly downhill with some flats. Those last two miles felt great. I felt like I was more consistent with my speed. By the time I got off the bike, the sun was out and it had heated up quite a bit. So I knew the run was going to be tough. I also had no idea what the run course was like having never been to the park the run was in. It started out on a road and then shortly after the start went through the gravel parking lot and then was on a gravel/mud/grass path. It was through the woods so I got eaten a live by bugs. 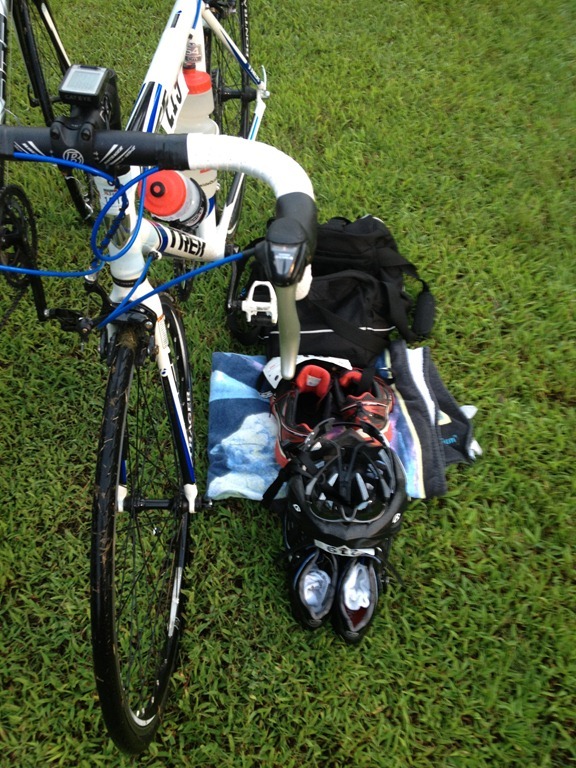 It was clear the bike had taken it out of me, and the humidity was just brutal. There were quite a few large puddles and muddy parts of the path as well that made the run pretty treacherous. The course was a loop and then an out and back to the finish. Once I got to the turnaround on the out and back section I knew this wasn’t going to be a pretty time. I felt like I swallowed about half a dozen bugs on just the run along. At this point I just wanted to finish and wasn’t so worried about what time I would get. I was slightly disappointed in how this race went. I shouldn’t have been too surprised because I was doing nowhere near as much training as I was for my first sprint since I was in half ironman training mode at the time, but I had hoped for better. It was a great race and the volunteers were amazing as always. 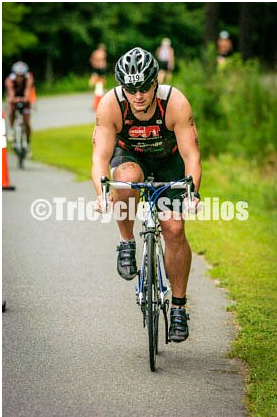 This was a North Carolina Triathlon series race, and they always put on great events. 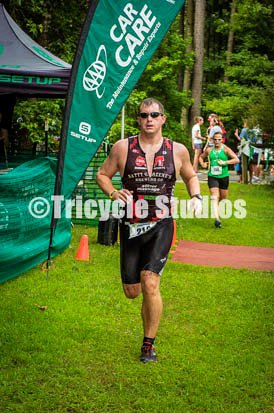 I’d be up for trying this race again next year to try and vindicate myself, but I’ll need to make sure to keep up the training post Raleigh 70.3 because like a fool I’ve signed up for that again. After the race I went Tyler’s in Apex with some of the IOSTC for a couple beers. After that I headed home, had a quick shower and then drove out to Wilmington for Saturday night and spent Sunday on Wrightsville beach. So even though the race didn’t go well it was nice doing it and contributed to a pretty spectacular weekend overall.